(September 27, 2015)–On Friday, September 18, 2015, internationally renowned Palestinian nonviolent human rights activist, Bassem Tamimi, was an honored guest speaker as part of the human rights curriculum in the third grade classroom of Beverly J. Martin (BJM) Elementary school. Unfortunately, the school has received undeserved backlash from community members who objected to Mr. Tamimi’s human rights activism. Mr. Tamimi is from the West Bank farming village of Nabi Saleh, which organizes weekly nonviolent demonstrations to protest Israel’s military occupation, illegal Israeli settlement construction and land confiscation. Grounded in an explicit commitment to understanding all cultures, BJM Elementary has brought human rights defenders with international and local perspectives into the classroom. Last year students read the autobiography of Malala Yousafzai, who defended girls’ right to an education in Pakistan, and met with activists in the We Are Seneca Lake organization, who are defending the human right to clean water in New York State. 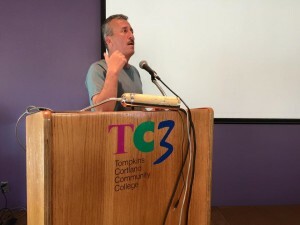 Mr. Tamimi, who has been recognized as a human rights defender by the European Union in 2011, and declared a prisoner of conscience by Amnesty International in 2012, was in Ithaca for scheduled talks at the Unitarian Church and Tompkins Cortland Community College as part of a national speaking tour. His talk at BJM Elementary took place as part of the school’s ongoing human rights curriculum. Despite the success of this educational event, unfortunately some community members have stirred up controversy over Mr. Tamimi’s visit. BJM Elementary and the Ithaca City School District have received intense backlash. In response, the Ithaca School District superintendent released a statement September 25, that listed as “egregious” several facts addressed by Mr. Tamimi, including that Israel has broken international human rights law, that in many instances Israelis have killed Palestinians in the West Bank and that Israel controls the resources in the occupied territory. The bullying and intimidation that took place in Ithaca following Mr. Tamimi’s visit to BJM Elementary is not an isolated incident. Rather, it is part of a deliberate strategy by defenders of Israel’s policies of discrimination that is intended to silence nonviolent human rights activists. This past week in Rochester, NY, Reverend Graylan Hagler, a longtime activist for social and economic justice, was disinvited from a speaking engagement on the connections between African American and Palestinian struggles for justice at a Rochester seminary. After receiving death threats, Rev. Hagler’s talk was moved to alternate venues, where he spoke to a packed audience of over 200 people. These incidents are just two of hundreds of occasions where efforts have been made to cancel or discredit speaking engagements by advocates of Palestinian human rights. Mr. Tamimi’s talks at the Ithaca Unitarian Universalist Church and Tompkins Cortland Community College were sponsored locally by the Ithaca Committee for Justice in Palestine, Amnesty International local group #73, Jewish Voice for Peace-Ithaca, Episcopal Peace Fellowship, Unitarian Universalist Social Justice Committee, Dorothy Cotton Institute, Catholic Workers, Veterans for Peace, Fellowship of Reconciliation, Vegans Against the Occupation, and the Tompkins Cortland Community College Sustainability Council, Office of Multicultural Services, Global Office, Social Science Program and Intercultural Club. Mr. Tamimi’s ongoing 6-week speaking tour will cover 20 US cities, and is sponsored nationally by Jewish Voice for Peace, Amnesty International USA, Friends of Sabeel – North America, and Interfaith Peace Builders. Interfaith Peace-Builders’ mission is to “give US citizens the opportunity to see and understand the Israeli-Palestinian conflict firsthand and to empower these citizens to educate their local communities and advocate for better US foreign policy when they return to the US.” www.ifpb.org.